The Directory of Catechesis compares the Church to a Mother who wants to pass on a treasure she posses to her children. By passing on such a treasure she continues to give life to her children and enable them to grow in their relationship with Jesus. The Church does this in a variety of ways. Catechesis is not just a short programme of a few weeks delivered when a group of children are preparing to receive one of the sacraments. Catechesis should also be present in other places and situations including in schools, homilies at mass and other events and gatherings organised by parishes from time to time. 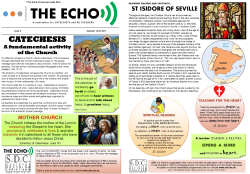 As teachers and catechists it is good that we find time to stop and reflect about our role as educators and people who like a good ‘mother’ we are trying our best to provide the best ‘food’ to those we teach in the form of an authentic Gospel message. The Church imitates the mother of the Lord in treasuring the Gospel in her heart. She proclaims it, celebrates it, lives it, and she transmits it in catechesis to all those who have decided to follow Jesus Christ. (From the "General Directory for Catechesis, paragraph 78). 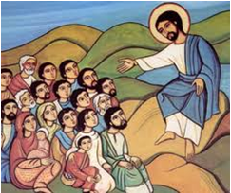 This is the job of the catechist: to constantly go forth to others out of love, to bear witness to Jesus and to talk about Jesus, to proclaim Jesus. Throughout the ages, the Christian Church has always been an effective institution of teaching and learning. Even in the early centuries of Christianity, Cathedral schools were influential agencies for education. Isidore, a great writer of the seventh century (c. 560-636), received his education in such a school in Seville, in southern Spain. Isidore dedicated himself to study and writing. Even when at the age of only 39 years he was chosen to succeed his brother Leander as Archbishop of Seville, he did not give up writing. In the words of Pope Benedict XVI, Isidore bequeathed to the world “an encyclopaedic knowledge of pagan classical culture and a thorough knowledge of Christian culture”. 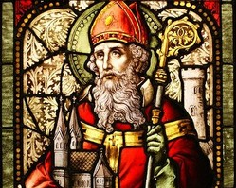 He is reputed to be one of the greatest scholars of the early Middle Ages and who had wide influence even beyond his time. He promoted education as means to strengthen the Christian faith and to foster unity amidst attacks by barbarians in Spain and elsewhere in Europe. This Spanish bishop was the last of the Latin Fathers and was declared a Doctor of the Church in 1722. He was named Patron Saint of the Internet by Pope John Paul II in 1997. As bishop, Isidore not only combated religious errors and introduced social norms of justice, but he set up a renowned school in Seville, considered then the best in all Christendom. This school provided an ideal of such vitality that the fourth council of Toledo in 633, required the setting up of seminaries modelled on it. Isidore died three years later on the 4th April at the age of 76. A few years after his death, another Council of Toledo in 653 described Isidore as “an illustrious teacher of our time and the glory of the Catholic Church”. On his feast day, 4th April, the Church prays that as she is aided by his intercession, she continues to be “instructed by his heavenly teaching”. "Teaching unsupported by grace may entour our ears, but it never reaches the heart. When God's grace does touch our innermost minds to bring understanding, then his word, which is received by the ear can sink deep into the heart." "All spiritual growth comes from reading and reflection. By reading we learn what we did not know; by reflection we retain what we have learned. The conscientious reader will be more concerned to carry out what he has read than merely to acquire knowledge of it. In reading we aim at knowing, but we must put into practice what we have learned in our course of study."